Good Morning All. Actually if you are east of the mountain time zone, it is now afternoon. All of the squadrons should have finished their PFT's by now and our photographers should be heading back in with lots of photos for us to process. Since this was our major coverage for today and it is still relatively early in the day, all the photos should be up by this evening. A note about the PFT/AFT photos. Our goal is to separate them into the individual squadrons. That being said, it is not always easy to do. Like intramurals, the squadrons can get a bit intermixed, so you may see multiple squadrons in your squadrons folder. We will do our best to separate them correctly, but you know how it goes... The BCT1 folder will have everything as usual. Something else that is going on today that you will all be interested in, are the "Official" squadron photos. WebGuy is NOT involved in this, however. These photos are taken by the Academy and if memory serves will be available for purchase during Parents Weekend along with the BCT Video which is always a great keepsake and will also be available for purchace from Cadet Wing Media during Parents Weekend. For those of you who will not be here, I'm sure it can be ordered. 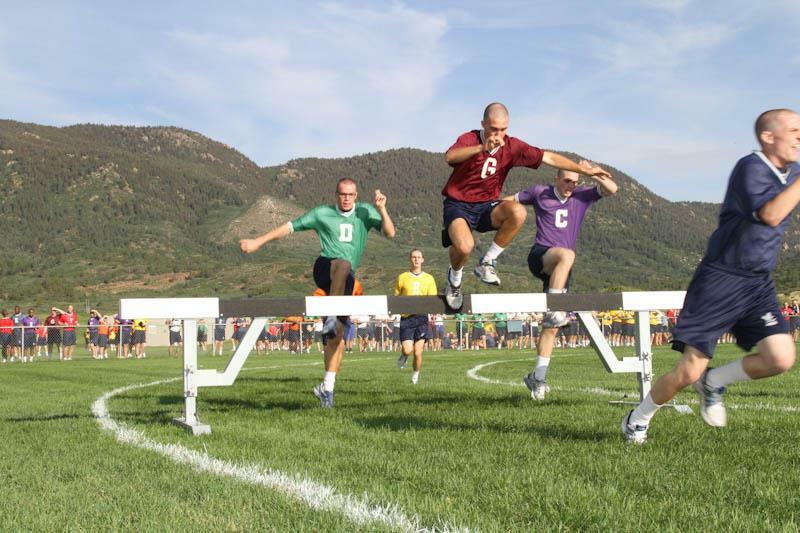 Check the Academy's website at www.usafa.edu for more info. Again, this video and the squadron photos I mentioned are NOT part of WebGuy, but are certainly worth getting. When my son was a Doolie, they were pretty much the only photos available. WebGuy was in it's infancy back in 2004. Ok. Now to the business of the day. Tomorrow is Field Day. 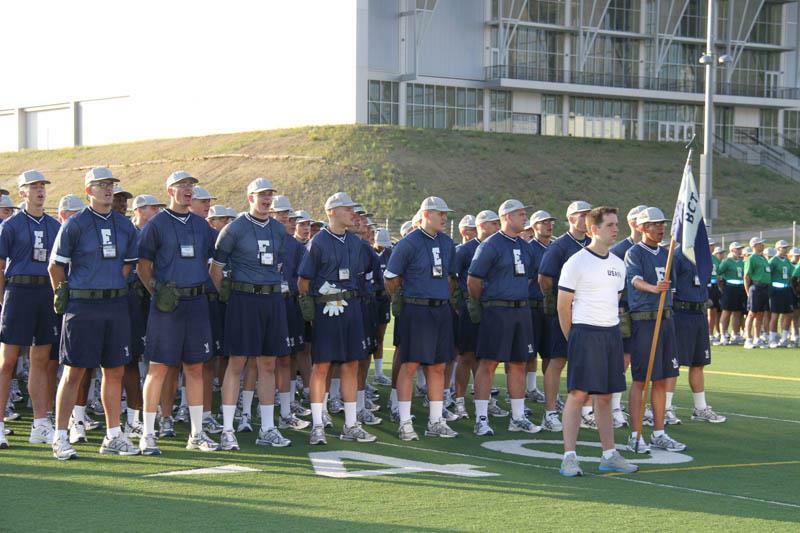 One of my favorite parts of BCT. It is the culminating event of 1st Beast. 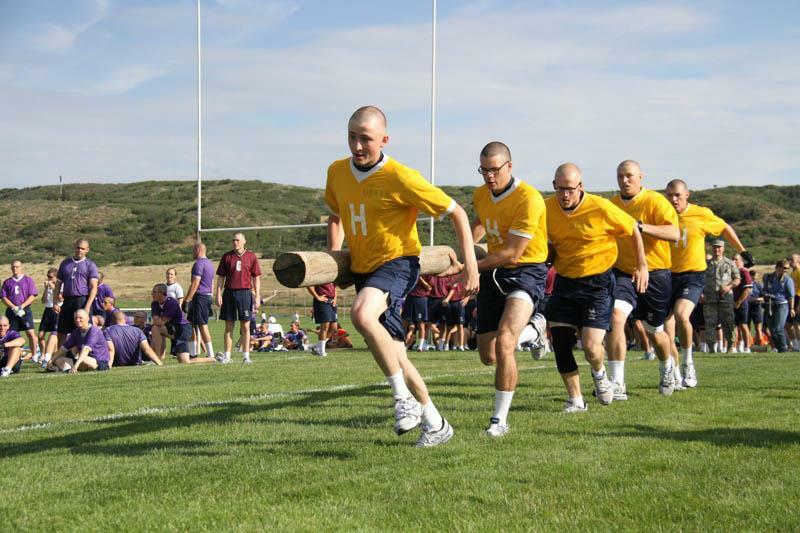 It is possibly the most fun event in BCT. 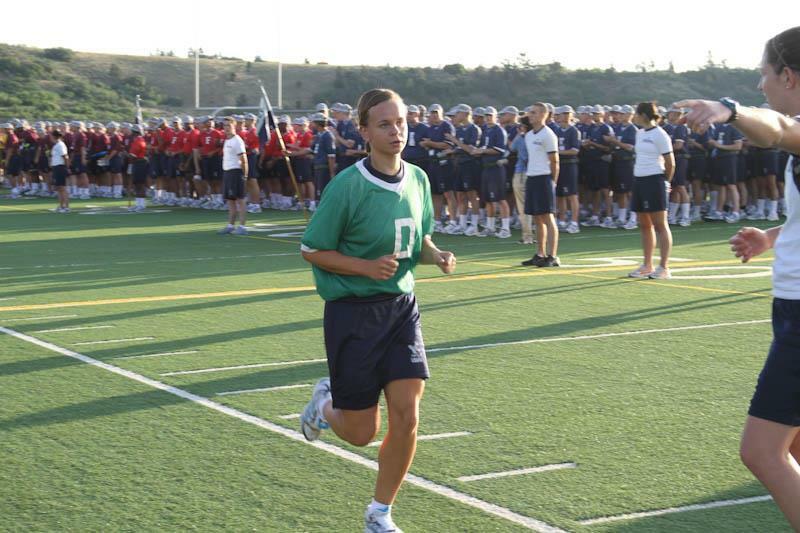 The squadrons compete against one another in each event in order to hopefully earn the title of "BCT 1 Field Day Champions". Here are some shots from the past couple years to give you a feel of what some of the Field Day events are like. 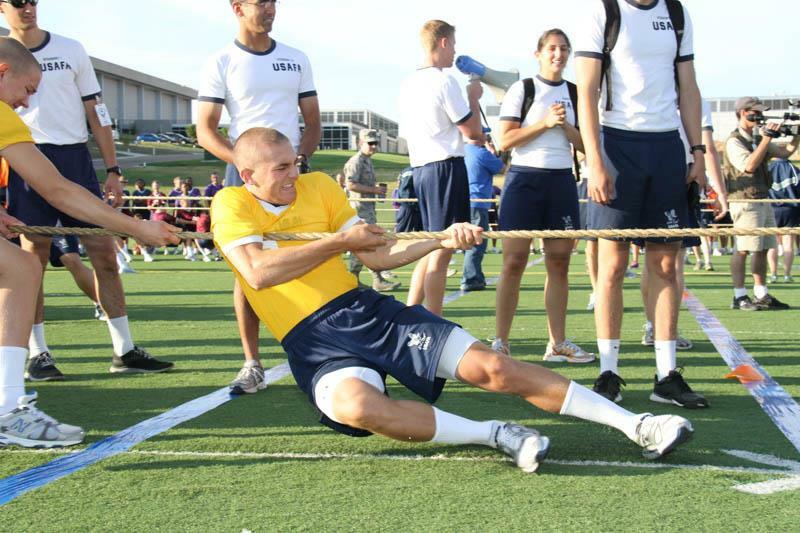 For those families that are close by and willing to make the trip to USAFA, Field Day starts at 0630 and ends about 1030 on the Athletic Fields. You won't be able to interact with your Basic face to face but you might be able to catch a glimpse of them participating in the events. Spectators are allowed to sit on the bleachers next to the athletic fields, but are not allowed to interact with Basics in any way. If you come by, you can also view the Noon Meal Formation from the Chapel Wall. We have 5 photographers deployed that day and we should be able to get lots of good photos of the action. Of course I always include the disclaimer about those elusive, camera shy, Basics. On an unrelated note... We have had quite a few questions about the colored dots on some of the badges. The answer is, we don't know for sure what they mean specifically. The closest answer I have gotten is that they had a use on I-Day for the various in-processing stations. Beyond that, I would be speculating and I have learned from hard experience not to do that. ;-). I have also had some questions about Acceptance Day on August 9th. I will have a good blog about all of that as we get closer, but not yet. That's it for now. Oh, almost forgot. 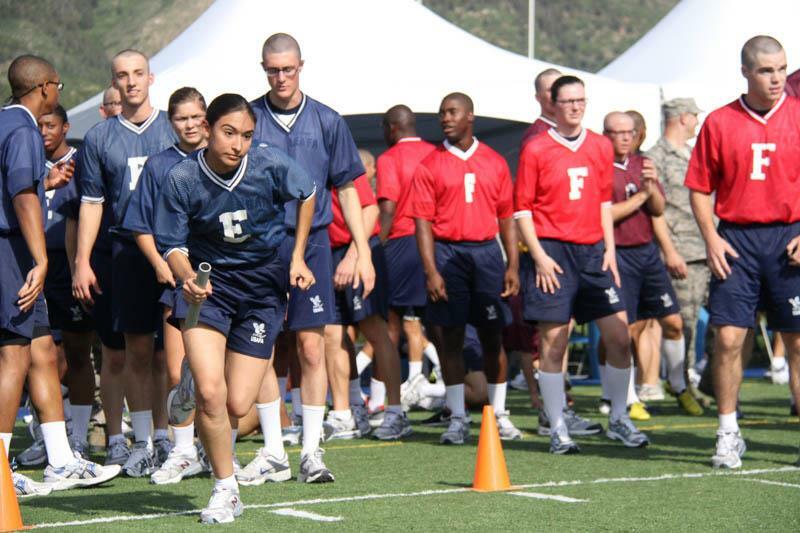 We will have a special gallery under the Class of 2020 for Field Day, so the individual squadrons will not be separated out. All the photos for that event will be in one place.